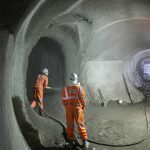 The Crossrail Sprayed Concrete Lining (SCL) design at C435 Farringdon Station completed by Normet UK is comprised of a permanent sprayed concrete primary and for the most part a cast in-situ secondary lining for both the main platform and concourse tunnels. The SCL design was to be used for all platform tunnels, concourses and cross passages, and also included ventilation tunnels and shafts. Of particular importance at Farringdon Station was the need for very high early strength concrete to ensure full ground support in the mixed Lambeth Group formations, which can often be sandy and sometime can flow uncontrollably if there is a lot of ground water present. 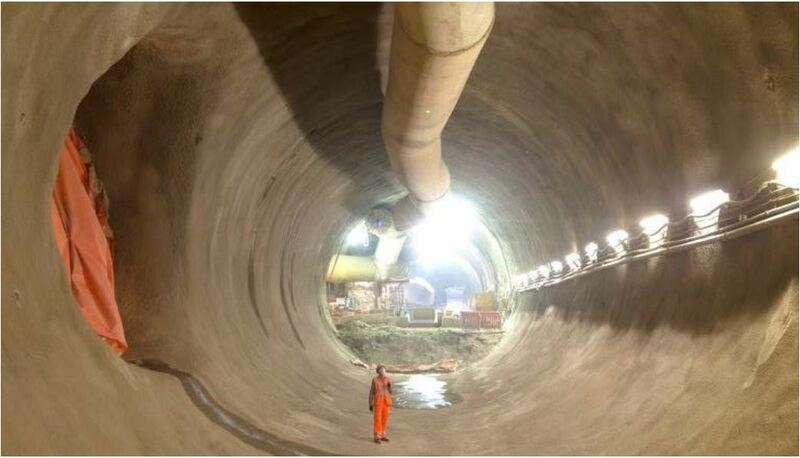 Furthermore, key London Underground and Overground railways exist above the Farringdon Station Crossrail tunnels. Therefore toolbox measures such as dewatering and probing were vital, coupled with a high performance, reliable sprayed concrete solution to ensure fast ground stabilisation and reduced settlement. The sprayed concrete challenge involved developing a pumpable, flow retaining wetmix sprayed concrete that could be delivered from either an on-site or off-site batching plant to meet the early strength requirement of “J2 modified” from 10 minute age, and the physical properties of a permanent, durable, fibre reinforced sprayed concrete lining. Normet worked full time with the BFK JV team in developing and fine tuning concrete mixes further from the successful trial period, and eventually defined two mixes based on open time – a 4 to 6 hr mix for site batched concrete, and a 8 to 10 hr mix required to facilitate off site batching and delivery through the busy London area. Both mixes used Normet’s TamCem 60 high performance plasticizer and TamCem HCA hydration control admixture, the latter being used to extend the open time of the mixes. To provide the enhanced early age strength performance, Compared to the requirements at C410, BFK JV selected higher dosages of TamShot 80AF set accelerator, typically between 7 and 8% by weight of cement to achieve the J2 (as illustrated below) modified requirements after spraying to 30 minutes age. The even higher performing TamShot 100AF was used for sections where higher risk of ground problems was envisaged. 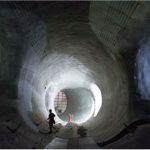 The BFK JV projects C435 Farringdon Station and C410 Bond Street and Tottenham Court Road Stations was a significant major sprayed concrete tunneling project beneath key high value structures in London. The logistic control of the mix and supply arrangements enable the contractor to reduce downtimes and wastage to a minimum, whilst achieving very high performance permanent sprayed concrete for both primary and secondary lining shells. Normet were successful with BFK JV is supplying over 60% of the sprayed concrete solutions on the largest Metro project in Europe.